The Bainaimiao Group, which crops out in the Sonid Right Banner area of Inner Mongolia, China, comprises mainly metamorphosed volcano-sedimentary rocks. This group can be divided into two formations: a lower formation characterized by intermediate-felsic volcanic rocks, and an upper formation of intermediate-mafic volcanic rocks. Zircon dating indicates that biotite leptynite from the lower formation and chlorite-sericite schist from the upper formation crystallized at 499±2 and 478±2 Ma, respectively, corresponding to different volcanic events. Meta-volcanic rocks of the Bainaimiao Group belong to the calcalkaline series, and the SiO 2 concentrations suggest that their protoliths were mainly basalts and rhyolites. Greenschist rocks of the group are enriched in light rare earth elements (LREEs) relative to heavy rare earth elements (HREEs), with (La/Yb)N ratios of 3.08–10.9. In addition, they are enriched in large-ion lithophile elements, including Rb, Ba and K, and depleted in the high-field-strength elements Nb, Ta and Ti. The felsic meta-volcanic rocks also exhibit relative enrichments in LREEs compared with HREEs, with high (La/Yb)N ratios of 2.92–9.89, and are enriched in Rb, Ba, Zr and Hf, and depleted in Sr, Nb and Ta. These geochemical characteristics indicate that the meta-basic volcanic rocks were originated from partial melting of sub-arc mantle wedge that had been previously metasomatized by subducted-slab-derived fluids, whereas the meta-felsic volcanic rocks were generated by partial melting of continental crust. 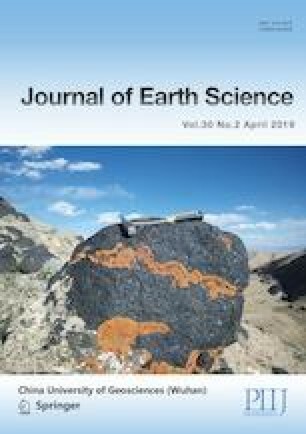 These results suggest that the meta-volcanic rocks of the Bainaimiao Group are the products of oceanic plate subduction magmatism along an active continental margin, which can be attributed to Early Paleozoic subduction of the Paleo-Asian Ocean plate beneath the northern margin of the North China Craton. Supplementary material is available for this article at https://doi.org/10.1007/s12583-018-1202-9 and is accessible for authorized users. This study was financially supported by the Nation Key R&D Program of China (No. 2017YFC0601305-01) and the China Geological Survey (Nos. DD20160048-04, DD20160343-08, DD20160343-09). We thank the reviewers and the editors for constructive comments. We are grateful to the staff of the Tianjin Institute of Geology and Mineral Resources, China, for their assistance with zircon U-Pb analyses. We also thank Wanqiong Wang, Zhiwei Fan, and Xinhui Bai for help in the field. The final publication is available at Springer via https://doi.org/10.1007/s12583-018-1202-9.